After the June War of 1967, the Palestinian Liberation Organization (PLO) established its headquarters in Jordan, where half of the population consisted of Palestinian refugees (who in 1969 were given the choice to opt for Jordanian citizenship, which a large majority did). From the East Bank of the Jordan River the Palestinian guerrilla groups undertook raids on the now occupied West Bank, which was followed by Israeli retaliation. In March 1968, an Israeli brigade attacked the Jordanian village of Karameh, supposedly the headquarters of most of the guerrilla groups. Although the brigade inflicted damage, it was driven back by Palestinian and regular Jordanian Armed Forces. 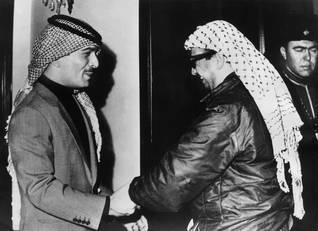 The incident improved Palestinian morale and won the PLO standing in the Arab world. Gradually the relations between native Jordanians and Palestinians deteriorated, especially between the Jordanian Armed Forces and the Palestinian guerrilla groups. On the Jordanian side there was increasing anxiety that the Palestinians would eventually try to take over Jordan. The threat to the authority of the Jordanian government and King Husein, and the large-scale Israeli attacks following each guerrilla strike became a matter of grave concern. Efforts to rein in and disarm the Palestinian guerrilla groups came to nothing. In the summer of 1970, skirmishes escalated within days when the Palestinian PFLP launched a campaign to hijack planes. On 6 September 1970, PFLP guerrilla units hijacked a TWA jet and a Swissair jet within the space of two hours, followed two hours later by the hijacking of a Pan Am jet. 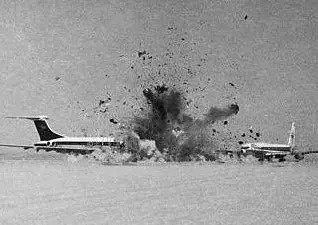 All the passengers were eventually evacuated from the planes before these were blown up by the hijackers in the Jordanian desert. Martial law was declared in Jordan, and fierce fighting broke out between the army and armed Palestinian groups. The clashes put the superpowers on alert. The United States dispatched part of its Sixth Fleet to the eastern Mediterranean, the Soviet Union followed suit. Israel issued ‘precautionary military deployments’ along the River Jordan to intervene if deemed necessary. After several truces and a partial withdrawal by the Palestinian guerrilla fighters from towns and villages, Fatah issued a statement in April 1971, demanding the overthrow of the Jordanian ‘puppet separatist authority’. In July, the Jordanian army undertook a new offensive against Palestinian guerrilla bases and ended the presence of the PLO in Jordan. The Palestinian organization transferred its headquarters to Lebanon. 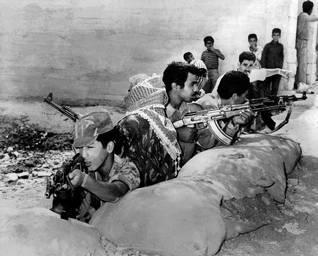 A Palestinian armed group took its name from the September war in 1970: Black September. Members of the group assassinated the Jordanian Prime Minister Wasfi al-Tal in November 1971 during his visit to Cairo. 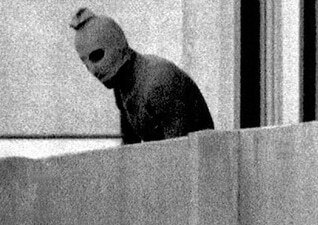 Less than a year later, in September 1972, the same terrorist unit took a group of Israeli athletes hostage during the Olympics in Munich, Germany. Eleven hostages lost their lives as a result of that action.